In recent years, the quest for sustainable primary energies has increased the potential interest of biogenic/fossil fuels mixes. As an example, ethanol is used as a gasoline extender to both partly substitute hydrocarbons and increase octane number while improving vehicle emissions. In a previous paper, it has been shown that ethanol and gasoil are able to blend and form homogeneous solutions only in limited proportion ranges, due to their markedly different physical and chemical properties. However the incorporation of small amounts of water in ethanol dramatically decreases this already narrow miscibility domain. Indeed, in function of the temperature, such ternary mixtures often give rise to liquid-liquid equilibria i.e. to two separated phases that are respectively lipophilic and hydrophilic. A key parameter is thus the Minimum Miscibility Temperature, the temperature above which ethanol, water and gasoil become completely miscible. On another hand, commercial gasoils do not constitute a single product but display worldwide a large range of compositions that influence the stability of these ternary blends. In this context, an investigation program intended to characterize and predict the stability of ternary ethanol + water + gasoil blends has been carried out by the LRGP laboratory. The approach is based on a thermodynamical, theoretical calculation of the liquid-liquid phase diagrams formed by ethanol, water and a mixture of various hydrocarbons representative of the diesel oil pool using the group-contribution concept. The basic idea is that whereas there are thousands of chemical compounds, the number of functional groups that constitute these compounds is much smaller. The work relies on the experimentally verified theory that a physical property of a fluid can be expressed as the sum of contributions made by molecule’s functional groups, which allows correlating the properties of a very large number of substances in terms of a much smaller number of parameters that represent the contributions of individual groups. 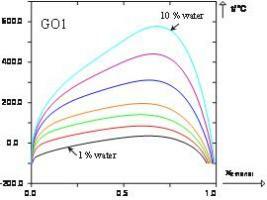 This work shows the huge influence exerted by the water content of ethanol on the shape of the liquid-liquid phase diagram and on the value of the Minimum Miscibility Temperature (MMT). As seen in our previous paper, the paraffinic, aromatic or naphthenic character of the fossil fraction, also considerably influences the value of the MMT. This study concludes that the MMT expressed in kelvins is generally multiplied by two when the water content rises from 1 to 10%.